One of my many hobbies is to collect movies that I have enjoyed watching. I like movies that are unpredictable, which provoke thoughts in my mind or It could also be a movie that is treated differently by the directors. Hence one would find a totally variant collection in my cupboard from drama to comedy, from thrillers to romance. Today, I would like to select a movie from the lot and review it. Moksha definitely is not a movie to be watched in leisure. You need to be in a proper mood to enjoy good cinema that will accelerate your thoughts. A dull start should not make one disappointed because that is what takes us slowly into the depths of the character and story. 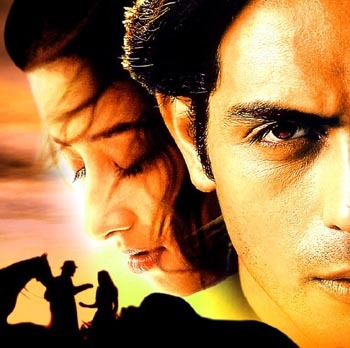 Moksha is the story of a young man named Vikram (Arjun Rampal) who soon after studying law joins a famous criminal lawyer as his assistant. Like most of us, he has great plans for the society and wants to bring a positive change in the country. But unlike most of us, he is dedicated and wants to fulfill it at any cost. He is restless, he has his own principles and he rules his world by them. Vikram is frustrated by the discrimination of the poor who not being able to pay the huge amount that the good criminal lawyers demand, loose their battles. He hates lawyers who make use of lie to suppress the truth. Vikram quits his job and irritated by this biasness, builds up an excellent plan. He wants to start an organization where any poor seeking justice can walk in and would be helped by a good lawyer, free of cost. He publishes this as an article on a newspaper and wins a lot of applause and appreciation from his colleagues and the rich friends of his dad. But then, that’s what it is, just a good article, no body wants to think any further. This organization needs a lot of fund and Vikram needs their money not just appreciation. His father denies wasting even a rupee on it. His father’s friends turn their backs as well. His lawyer friends agree with him, but they need to be paid by his organization. Only his uncle and his professor stand by him (Played by India’s finest actors Paresh Rawal and Naseerudin Shah) but what he needs is not just support, a lot of money to transform his ideas into reality. Vikram meets Ritika (Manisha) who joins him in his passion for creating this system and vows to be supportive of him forever. The relationship between the two is very well depicted in the movie, unlike any other couples shown on silver screen. They discuss, they debate and argue on general issues and get influenced and inspired by one another. Seeing no sign of help from wealthy side of the society, Vikram makes a terrible plan to rob a bank for this good cause. Ritika is against it, but as per her promise to Vikram, she is forced to stand by him in all the decisions he takes, failing which she would have to face a terrible punishment decided by him. On the day of the robbery, his plan goes terribly wrong. And life takes an unexpected turn and he is arrested for murder. Here begins a total new episode for Vikram. He now has to use all those wrong moves to save him, which he once hated, which once were against his principals. He has to make use of people, abuse them with horrible words and do all that which he once fought against. The movie takes a very different twist even at the end. Watch Moksha, if you really want to see a good movie; a real good cinema with collection of such wonderful thoughts, ambitions and twists and turns of life that change our total perspective towards it. Probably that’s how life is, our opinions, or views change continuously as per the different circumstances and events that shape, break and re-shape us daily. Of course the movie is a little exaggerated version of the same. Havent seen it. Thought it was a bakwaas movie. I will check if it's available on DVD. I love the song "jaanleva" from the movie though. By the way , was just checking ur posts 'bombay blast' and 'this is me '....Nice posts ...nice poetries.. I haven't watched this movie. Although I'm a big fan of Hindi movies, haven't had a chance to watch many lately. Like you said, life takes over and our priorities change. Will check this one out though...sounds interesting. If you like movies with surprises try, Memento, Vanilla Sky or Mulholland drive. Man they make you think! @Harsha - Yes, Many good movies just go unnoticed, These movies does not find commericial success because of limited audience. But I think things are changing now. Excellent realistic movies are coming up and are succeful at box office too. @ ReBorn - Thanks for stopping by. @ Travel Plaza - Its good to hear that you enjoy watching Hindi movies. So what movies have you seen so far? "Saw".."River Runs through it", "The Hours" & "The beach" are some of my favorites. Oh man... I remember seeing this movie and I just loved it then! Vikram's love for Ritika is great, so is Neelima's love for her.. and the way he argues in the court that Ritika and Neelima have something between them is too good..
Vikram's character is so well-etched in this movie... I loved it man! Thanks for reminding this to me again! Decent effort to make a hollywood type movie & good cinematography. I thought it was a remake of some English movie. I watched Ghost world, it is nothing in common with Moksha, but very different movie. You might like it..
@SG- The court scenes are simply brilliant. I love the scene at the end when her friend spills out the truth. @ Kishan - Yes...It is a very well made film. Will try to catch hold of the movie that you are recomending.